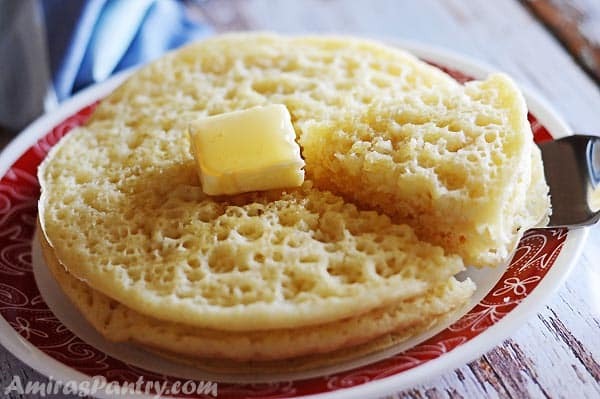 Spongy pancakes riddled with thousand tiny holes, this is Baghrir my friends. 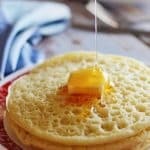 When you are craving some sweet fluffy pancakes dipped in honey or syrup, here’s the recipe you need to make hassle-free authentic Moroccan pancakes at home. 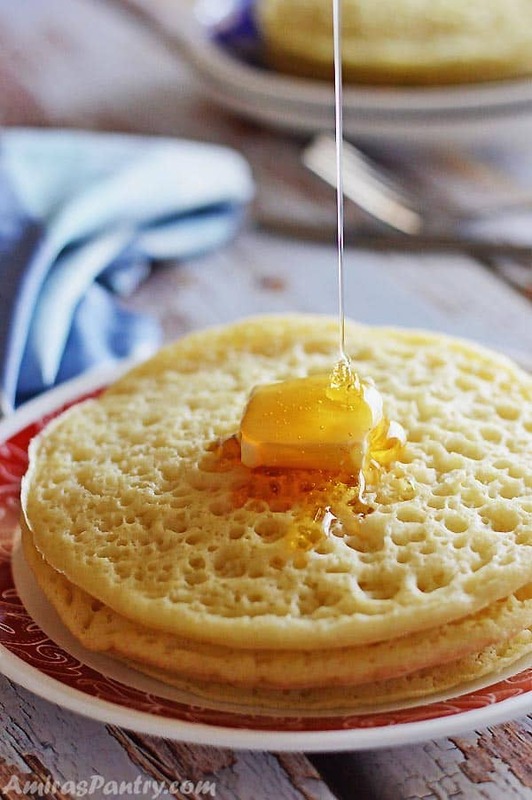 Baghrir is a very airy and spongy kind of pancakes. 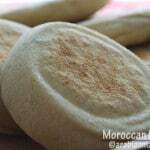 A Moroccan traditional recipe that is unbelievably light. 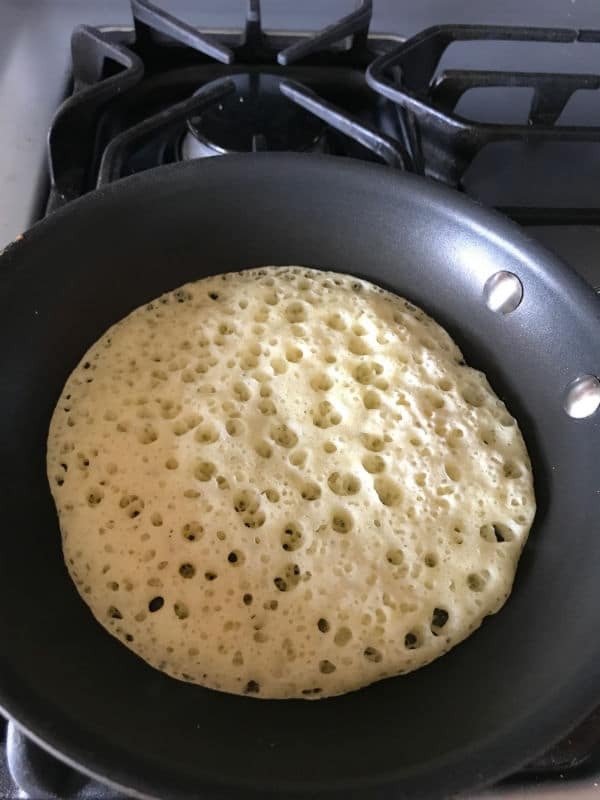 I rarely make pancakes, I am not a fan either!!. When my kids want pancakes, they usually make it themselves. They open the ipad, search for a recipe, gather ingredients and make it. I need to post a photo of the kitchen after they are done making it, complete mess :/. Baghrir is a Moroccan twist to the pancakes, but let me tell you it is very easy to make and very light. 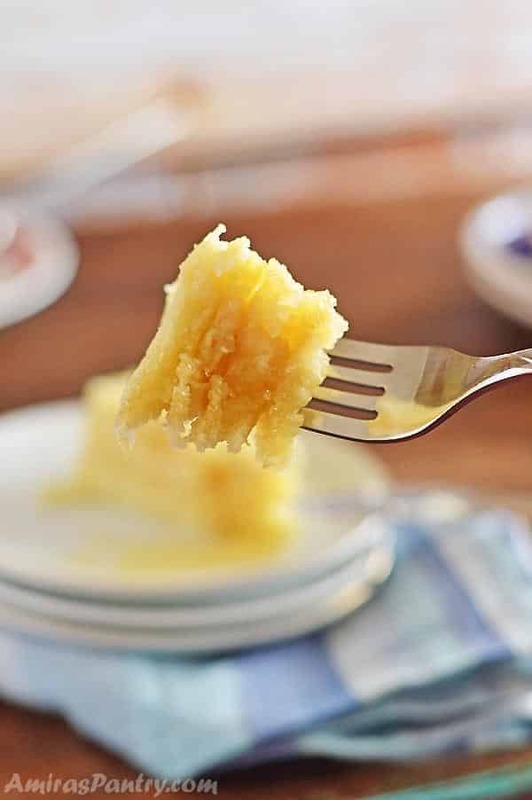 It is spongy to the point that when you drizzle it with honey it soaks up all the honey and becomes succulent and so delicious. And it is so easy to make, much easier than the regular pancakes, let me show you. First: put all the ingredients except the baking powder in a blender and mix well. Then add the baking powder, mix again. Let it rise in a warm place for 30 minutes. Heat an 8″ skillet, pour the batter until it spreads all over the skillet. You’ll notice lots and lots of tiny bubbles forming on the surface, much like the Atayef but even more in bubbles. Cook only on one side. Let it cool down and serve. Batter should be runny, easily pourable and spreads easy to the edges of the pan. It should not be lumpy as the pancake one.If yours is not runny enough add more water by a Tablespoon at a time. I was first introduced to the savory form of baghrir, my friend rolled them over hard boiled eggs cut into pieces, it was very good. 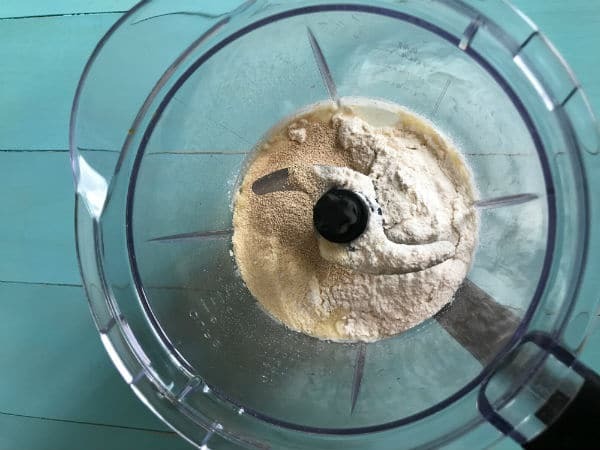 She said they used to make it by hand back in the old days and it required lots and lots of mixing, but today’s blenders made it super easy to make baghrir. What I like most about baghrir – besides its spongy characteristic – is that it is very easy and that no guessing is required. I always hated the ” do not overmix” word on the pancake boxes or recipes. With baghrir a twirl in the blender and it is done and successful too. My kids ruined the Moroccan heritage by eating Baghrir with maple syrup, but at least they were kind enough to eat it with the pure natural one :). I enjoyed mine the traditional way, with honey. This is a great recipe for breakfast/treat , easy, simple and you can make it for a change to your everyday pancakes. You can freeze and reheat just as you do with pancakes. 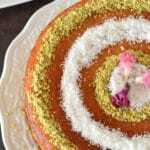 Have you ever tried Baghrir before? where did you try it? and what was your best way to enjoy it? If not, I hope you’ll like this recipe and probably make it soon… Until next recipe, have fun in the kitchen. 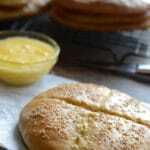 Not your everyday pancakes, a traditional Moroccan recipe that is so spongy and light. Makes 8 pieces, 8″ pancakes. 2 1/2 cups warm water. a dash of salt , about 1/8th teaspoon. 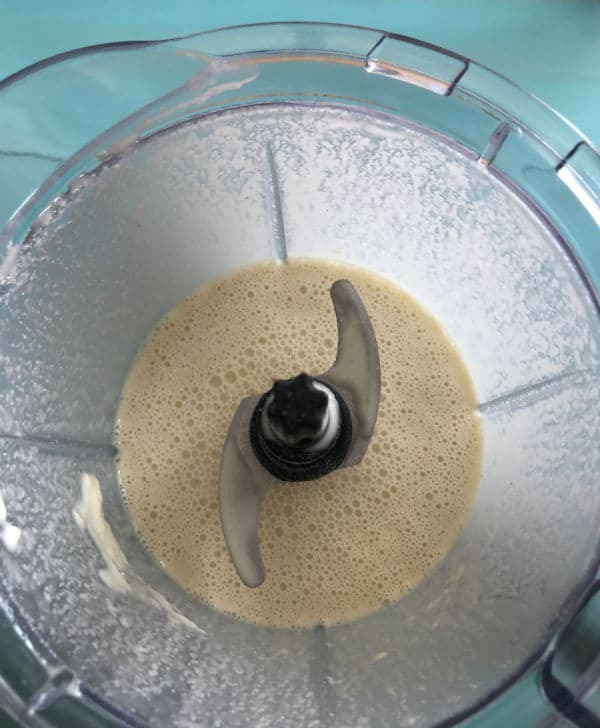 In your blender, combine water, yeast, flour, semolina and salt, pulse until everything mixes well together. Add the Baking powder and mix again. Place in a container and cover to rise, will take approximately 30 minutes. Heat an 8” skillet over medium heat, pour about 1/2 cup of the batter into the skillet. Batter should spread to the edges of the skillet, if not then thin it with more water . see notes for clarification. Let them cool down a bit before serving. Serving suggestions: Traditionally, these are enjoyed with butter and honey. Also for a savory twist, sometimes can be rolled over olive oil and hard boiled eggs( cut into small pieces. 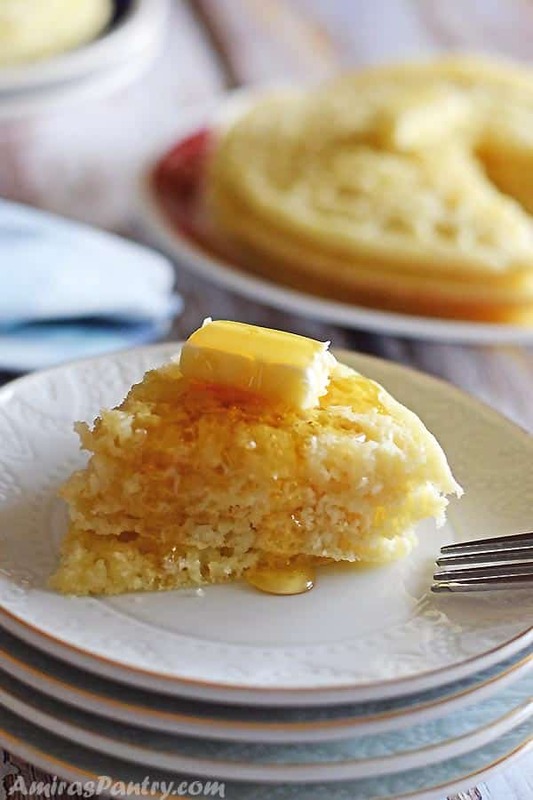 Practically, this can be enjoyed with your favorite syrup. *If the batter is not thin, add water in terms of 1 Tablespoons until it gets to the right consistency. ** If the pancakes start to curl up at the edges, you know it is overcooked. Excellent post. May I suggest that the the words Baking powder in the bodytext be changed for yeast?. The latter is among the ingredients listed in the recipe.This is a tiny flub but I think it is worth correcting. Thank you. C de MC, thank you for the comment. It is not a flub, actually the recipe uses both . Vanessa, I haven’t tried that but I would assume they will keep like pancakes. These looks so good ! What a fun twist on pancakes! I bet kids love how they absorb syrup! 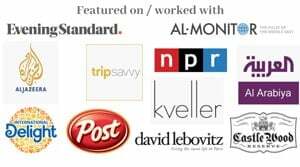 Suzanne, thank you for your sweet words. You bet, kids get excited about it every time.